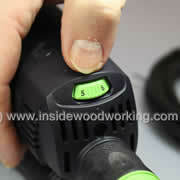 Present day variable speed electronics will allow you to adjust the speed of the jigsaw on the fly. Of course, what you do depends upon the material being cut. Woodworkers benefit from variable speed controllers, when cutting thin plywood, metals, or an array of plastics where you want to reduce the cutting speed. Most jigsaw manufacturers such as Bosch, Makita, Dewalt, Festool, Ryobi, Black and Decker, Hitachi or Craftsman offer some or all of their models with variable speed electronic. Keeping a constant speed control is best accomplished by a small electronic devise built into the unit. It doesn’t require a visible switch and it automatically boosts the motor power as it senses the cutting encountering difficulty. 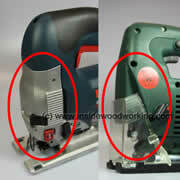 This way the jigsaw maintains the blade speed providing consistent performance. It is very important in heavy-duty jigsaw applications, such as for carpentry or framework, where large depths of cut are common. Various manufacturers set soft grip inserts into the handle part of the jigsaw. 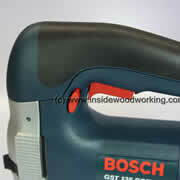 The rubbered material lets you handle the tool without slippage providing much better control. A little light spot on the cutting line on this Metabo jigsaw. This is the front part of any jigsaw housing. It holds the barrel and the gears. The best professional jigsaws are made of a metal (cast) gear case. The majority of DIY units (non-professional) encase their barrel and gears in a plastic housing. For the professional tool, a metal case (holding the gears and bearings) guarantees a much longer life for the power tool. The metal case also guarantees a lasting resistance against overheating during heavy usage. Important tip for reviewing some of the best jigsaws gear cases: As you look for any metal gear case on a jigsaw, make sure you watch the tools front end in detail, as some manufacturers (e.g. Festool), cover their metal gear case with PVC for heat and design purposes. This is the front part of any jigsaw housing. It holds the barrel and the gears. 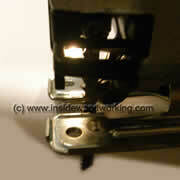 The professional jigsaw is made of a metal (cast) case. The majority of DIY units (non-professional) encase their barrel and gears in a plastic housing. For the professional tool, a metal case (holding the gears and bearings) guarantees a much longer life for the power tool. The metal case also guarantees a lasting resistance against overheating during heavy usage. Another tip might be, as you look for any metal gear case on a jigsaw, make sure you watch the front end in detail, as some manufacturers (e.g. Festool), and use PVC for their gear case. 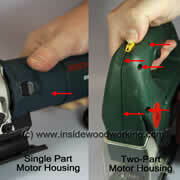 Price is your first indicator between a professional and the DIY power tool. The second attribute involves the type of housing used. Professional units have what is called "full housing." That means the housing or body and armature is held in a single body together with all gears and bearings. This means all motor components offers the user a higher precision. In comparison generally speaking DIY jigsaws are less durable as the tool body is in two halves held together by a series of screws.